Shake or Stir up any gathering! Here's a quick idea of how to play. Choose your token (Seltzer Bottle, Ice Bucket, Olive, Cherry, Lemon Twist, or Martini Glass), buy favorite cocktails, then collect ice cubes and trade them in for decanters. Sounds easy enough but add bartending school and outstanding bar tabs and it becomes a little more difficult and a lot more fun! 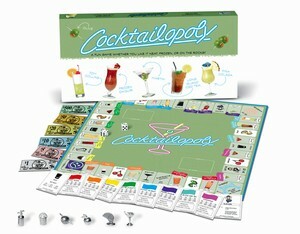 As you play, flip the deeds over and learn enough about cocktails to become your own bartender! It's all fun and games until you're sent to Hangover - then you're queasy and green and out of the game for three turns! Choose your token and advance to CHEERS! Who knows? You may take first place in the Master of Mixes Cocktail Contest...or you may be counting "one tequila, two tequila, three tequila, FLOOR!" Whatever happens, it's a fun game whether you like it neat, frozen, or on the rocks! For 2-6 Adult players ages 21 and up.